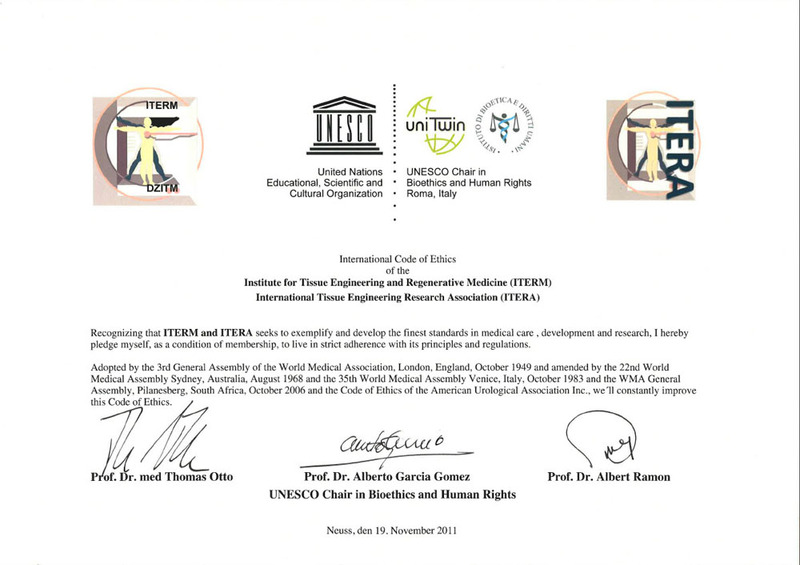 Recognizing that DZITM and ITERA seeks to exemplify and develop the finest standards in medical care , development and research, I hereby pledge myself, as a condition of membership, to live in strict adherence with its principles and regulations. Adopted by the 3rd General Assembly of the World Medical Association, London, England, October 1949 and amended by the 22nd World Medical Assembly Sydney, Australia, August 1968 and the 35th World Medical Assembly Venice, Italy, October 1983 and the WMA General Assembly, Pilanesberg, South Africa, October 2006 and the Code of Ethics of the American Urological Association, Inc.we constantly improved this Code of Ethics. incompetent or who are involved in fraud or deception. refering patients or prescribing specific products. seek appropriate care if he/she suffers from mental or physical illness. respect the local and national codes of ethics that are in concordance. report financial and other conflicts of interest, that could influence his/her approach and decisions in medical, scientific, and educational duties (or actions). shall use new technologies or methods only to the best for her/his patients and only after sufficient examination. Fraud and deception shall be reported to authorities. physician who has the necessary ability. can be only removed by a breach of confidentiality. others are willing and able to give such care. has full knowledge of that situation. other abusive or exploitative relationship. confidentiality and be confined to necessary information. I believe my responsibilities to the community and to society are part of a physicians code and that a physician must safeguard the public. I will work constantly to improve this Code of Ethics and will full fill this code with live. Hopefully this Code of Ethics will serve as a frame work for evaluating and deciding on these emerging issues.